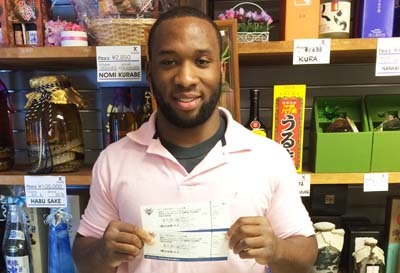 Sean Sutherland is the lucky winner of this week’s Japan Update raffle. 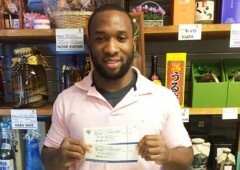 He won a pair of tickets to Ryukyu Golden Kings basketball game. He has lived on Okinawa four years, and has about one and half years left as he and his family scheduled to move on in Aug. 2015. He says that his life here has been nothing short of fantastic. “I’m a father of three, and a very active musician, a drummer, in our church United Christian Center,” he explains. He also says that he enjoys spending time with his wife and children sightseeing around d the island. He says that there are plenty of local foods that he likes, but he lists curry, Okinawa soba, sushi and ramen noodles as his favorites. “I think the best parts of Okinawa are food and its people,” he says. In the near future he is planning to visit Shuri Castle, which is one place on the island that he has yet to get to. He also would like to find time to visit some of the smaller islands near the main island of Okinawa.